Welcome to St Martin in the Bull Ring. This is one of the most ancient and contemporary buildings in Birmingham. Most of this Grade II listed church is from the nineteenth century. It was built in 1873 and is an example of gothic Victorian architecture, designed by Alfred Chatwin, from Birmingham, who also worked on the Houses of Parliament. But St Martin’s is much older than that. There has been a church on this site since 1290 and there may well have been a simple place of worship here even in Saxon times. St Martin’s is also a place of worship for a thriving community who refurbished the building in 2000, making it more light, open and accessible. In 2009 we created a tea lounge, healing centre, and rooms available to hire so our hospitality in the heart of the city could be extended. We believe that what Jesus called ‘Life in all its fullness’ can be discovered right here in the crosscurrents of the marketplace. You are very welcome to come in and walk around. St Martin was a soldier. He was born in Hungary in 316 and never wanted to join the army but was obliged to by law. At the age of 18, he was posted to Amiens in France. One bitterly cold winter’s night he was riding through the city when he saw a half-naked beggar huddled against a wall. Martin was so moved by the sight that he cut his cloak with his sword and gave one half to the beggar. That night he had a dream in which Christ appeared to him as the beggar and thanked Martin for clothing him. In response, the young soldier got baptised. Later he was to leave the army to become a soldier of Christ, eventually becoming Bishop of Tours in France. St Martin is remembered today for his service to the poor. That story continues to inspire the community here at St Martin’s. Like our patron saint, we are committed to working with the cold an hungry. We have a team of volunteers who visit those sleeping rough in the city, and an integrated health and healing centre. Whatever a person’s circumstance in life, he or she can come to this place for consulting and support. We also provide advice about money and housing, and offer access to training and jobs. We see this work as all part of our worship of God. The central figure around the edge is of the pulpit is Christ. Elijah and Moses are to the left of him and St Peter and St Paul are on the right. This pulpit has seen some historic moments. Dame Elizabeth Cadbury, the 1925 president of the National Council of Evangelical Free Churches, preached here. 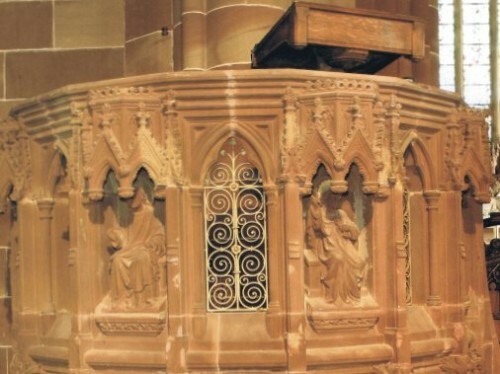 It was the first known time that a woman had spoken from a Church of England pulpit. In 1969, the Archbishop of Birmingham, Patrick Dwyer, preached on this spot, making him the first Roman Catholic to preach in the Church of England since the Reformation. St Martin’s also has an outdoor pulpit on the side of the building opposite Selfridges. It was built in memory of Dr John Miller, a rector of St Martin’s in the mid-nineteenth century, who was a great social reformer and zealous open air speaker. Called the Miller pulpit, it was much used in the 1950s and 60s, to spread God’s word in the marketplace. It is the only one of its kind in Britain. In the chapel on the left hand side are three stone figures. These are monuments of the church’s founders – members of the de Bermingham family, who were the lords of the manor and lived in a moated manor house a bowshot away. Peter de Bermingham set up the first market here in the twelfth century. He was granted a charter in 1166 by King Henry II. It is quite likely that even then the de Berminghams had a simple place of worship for the family on this site. The first church of which we have records, however, was built in around 1290 by Peter’s descendant, William, and his wife. 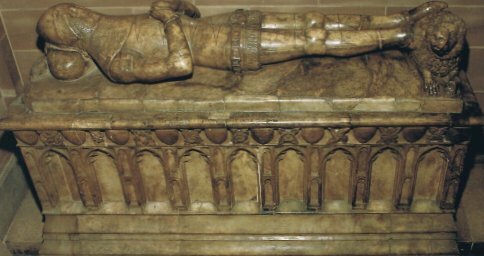 The alabaster monument on the left dates to 1390 and is said to be of Sir John de Bermingham. The one in sandstone nearest the entrance of the chapel on the right is thought to represent Sir William de Bermingham. This dates back to 1325 and as such is the oldest monument in Birmingham. Notice his legs are crossed above the knee. This means he fought in two crusades. The one nearest the altar is of Sir Fulk de Bermingham and dates to around 1350. If you are are tall enough you might be able to see that Sir William and Sir Fulk’s monuments are very worn on the top. In a 1925 history of the church it says they have suffered from the “hands of time and the feet of the window cleaner”, positioned, as they once were, beneath windows in an aisle. This Chapel is known as the Chapel of the Guild of the Holy Cross. The Guild was established in 1383 by Birmingham men and women with a royal licence from King Richard II. The guild, which was a kind of union, was unusual because it was open to people whatever their trade – women, as well as men. Members paid to belong. The guild in turn funded a midwife, an organist, a bellman and two priests to say mass in the chapel each day. It had the powers of local government and was involved in charity, including the building of four almshouses and the Guildhall which was roughly where the Odeon Cinema on New Street is now. In 1552 members of the Guild founded King Edwards’s School which continues to be one of Birmingham’s leading schools to this day. In 1956 the chapel was restored in his memory by the family of James Neale Thorne, an American who flew with the RAF in the 2nd World War and was killed flying over Arnhern. To the left of the window there are stones from the medieval church. These were set in to the masonry when it was knocked down and rebuilt in 1873. Go through the archway on the right. Here is the high altar and east window. The alabaster sculpture behind the altar was a gift from the congregation and Freemasons of Warwickshire when the Victorian building was completed in 1874. It depicts scenes from the end of Christ’s life – the last supper, the entry into Jerusalem, the cleansing of the temple, the agony in Gethsemane and the kiss of betrayal. The window was made after the Second World War. St Martin’s church was bombed in 1941, shattering the original Victorian stained glass. Underneath the cross, in the replacement window, you can see the citizens of Birmingham in their wartime clothes. 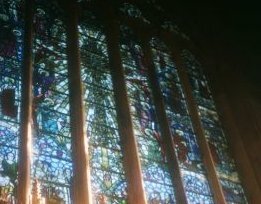 The theme of the window is healing. The window itself is a kind of healing – a restoration – and depicts eight of Christ’s miracles. We believe that our health and healing centre and our Tuesday lunchtime healing services are a continuation of Christ’s restoring work today.